Will A Waterbed Crash Through My Bedroom Floor? So you’ve probably heard about waterbeds and how they can enhance your sleeping experience dramatically, however, many people still have doubts about whether or not they are right for them. Many people fear the weight of a waterbed will crash through the bedroom floor it’s resting on. While this may be a fear of yours, in most instances it shouldn’t be. Perhaps one of the most widely asked questions’ concerning waterbeds is if their floors can handle the weight of a waterbed? This is a great question, especially if you live in an apartment building, new or old house, even a mobile home. Other options often include upstairs attics or a porch that has been converted into a bedroom. If you are living in a house, apartment building, or mobile home, depending on where you live the structure should have to comply with local inspections to ensure that it meets the standards of various building codes. One of these codes is making sure that the floor is strong enough to handle its occupants and strain they will put on the floor. Did you know that waterbeds consume less weight per square foot than a refrigerator, washing machine, bookshelf, or fish tank? 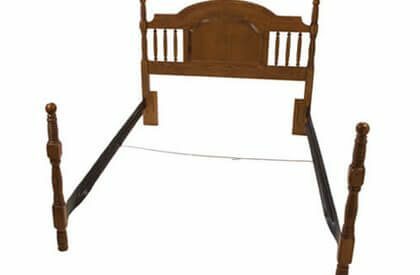 If you are able to have a these items in your home, more often than not you can have a waterbed without worrying about your floor caving in. Often you can get a feel for the floors sturdiness by walking through a room casually. If things on shelves rock and rattle violently because of a spongy floor definitely seek profession advise. More often than not attics and old converted porches do not have proper supporting floor joyces. Trailers /mobile homes with out proper peering or foundation may not support them as well. There are light weight options to the traditional wood frame hard side waterbed. There are two additional different types of waterbeds that have been made to ensure less weight. These two types of waterbeds include Deep filled softside waterbeds and shallow filled soft side water mattresses. Both are still extremely comfortable, and they both weight between 40 percent and 70 percent less than traditional wood frame water bed. Since these waterbeds are so lightweight they allow individuals additional piece of mind that they can own one without fear. Waterbeds are a great way to relax and enjoy a great night of sleep. However, many people are afraid that their floor is unable to withstand the weight. 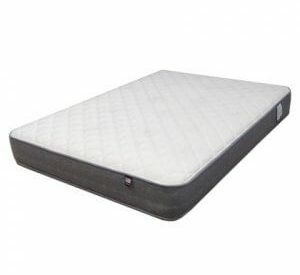 Yet, this concern of safety and protection is eliminated with the newer lightweight beds. Even though the old hardside waterbeds could weigh as much as two thousand pounds (2000lbs), a house that has been inspected and passed all modern building codes should be able to handle the load. 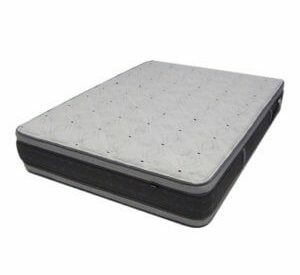 This is because the waterbed weight is distributed over a broad area. Approximately 50lbs per square ft., thus exerting less weight per square foot than many items you currently have in your home now. However, if you are afraid that your floor may not hold the load, I would suggest seeking the advise of a building inspector, general contractor, or even your insurance agent to get additional advice. My opinion is this, if your house can’t handle the weight of a waterbed, then you should probably keep an eye out on your refrigerator and a few other house hold items, they may be just as likely to surprise the people living under you. Bottom line in, if in doubt you should seek assistance or advice from a professional who can determine the structures floor strength. approximately how much weight can an upstairs room hold? I cannot say for sure it would vary widely, that would be a question for an engineer, architect, maybe even your insurance agent. 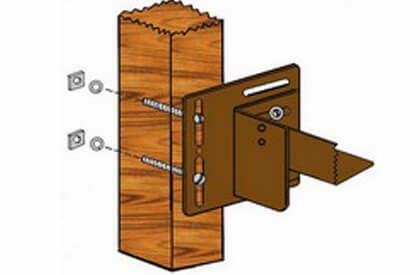 A simple test although not conclusive by any means is to check the second floor for vibrations. Maybe have a couple people walk through out the second floor while a third looks and listens from downstairs for shuddering ceiling fans and rattling light fixtures even easy to hear footsteps. In new construction I would try to determine what load standard the builder is using or in preexisting structure what was used. This is not my line of expertise but these are terms you may want to Google; wood floor joist construction, concentrated and uniformly distributed live loads, uniform partition load. Waterbed I believe would be a dead load. Thanks for the great question. I am sure it will help others. Actually, a waterbed would be live load, dead load is the weight of the floor itself before anyone is present./ Live load is anything the person living there brings in. A waterbed load is a mix of live and dead. The weight of the bed frame would be considered a dead load since it’s static, but the water itself could be considered dead when it’s still, or live when it’s sloshing around (slosh dynamics). MY LANDLORD IS TOO SCARED TO LET ME FILL UP MY WATERBED. IS HE JUST BEING A LITTLE FEMALE DOG? I LIVE ON THE SECOND FLOOR AND HE SAYS THE APARTMENT UNDER ME HAS THEIR BEDROOM DIRECTLY UNDER MINE. THERE IS A WE BIT VIBRATION OF THE FURNITURE WHEN WALKING AROUND MY BED ROOM BUT THE VIBRATIONS IN THE KITCHEN ARE MORE EXTREME AND I HAVE A REFRIGERATOR AND STOVE IN THERE. THE FLOOR OF THE KITCHEN HASN’T CAVED IN YET. SHOULD I JUST FILL UP THIS KING SIZE OLD SCHOOL WOOD FRAME WATER BED AND HAVE A GOOD OL’ SLOSH FEST ON IT WITH MY WIFE AND SEE IF WE END UP IN THE APARTMENT BEDROOM DOWNSTAIRS ON TOP OF THOSE HEATHENS THAT LIVE THERE? ANSWER QUICKLY PLEASE BEFORE I KILL SOMEONE. LMAO!!!!!!! Lori, We understand their position and don’t think it is ridiculous at all, I’ll explain. I am going to assume by breaking you mean popping? waterbed and I sleep on it alone…i mention that so you know i have not caused it…so there is no sloshing around on it I don’t understand why has become creaky. I have gad it set up for one year now..
What is the type of waterbed mattress that weighs the least. We went from a full bladder to one that had baffles but I’m wondering if anything newer has come on the market. I have a SINGLE waterbed that I’ve replaced the mattress part (that holds the water) approx 15 years ago, and set it up. My heater “burnt out” approx 7 years ago and haven’t slept in the bed since. I managed to finally find a store that sold waterbed parts approx 5 years ago and bought a heater (and the fluid you add to the water), but never found the time to set it up. I’ve moved now from a townhouse to a house, I’ve never had a problem with the waterbed except the heater. I now have the time to set up the waterbed and put an empty bedroom to some use. I have a friend who is telling me that I need to find out if the house will hold the waterbed without collapsing through the floor.. I had no problem with it in a townhouse, why would I in a house? (It was also set up in 2 different houses before I got it.) How do I find out? P.S. I’ve read the comments above and I’m now wondering if I need to replace the liner.. When the heater “burnt out” (which was really weird) the liner sort of stuck to the heater. I had no problem separating them and I don’t think there are any holes, I’ll have to check it. Now to the term “burnt out”.. One morning I woke up and realized the bed was really hot so I turned it down. Waited a couple days before sleeping in it again and still it was hot so I turned it almost to the off part. A couple days later I had to turn it completely off, it was as hot as if I hadn’t turned it down at all. Decided to lie down on it a week or so later thinking the bed was completely cool. It was not. So I unplugged it. Hence the reason for buying a new heater. My landlord was more afraid of mine puncturing and flooding the apartment below whom incidentally was his apartment. In my lifetime I have had 5 waterbeds and none of them punctured as the vinyl was very strong. Another thing is with the heater you never climb into a cold waterbed on a winter night. I forgot to mention a waterbed store many years ago had a full waterbed set up on upside down styrofoam coffee cups. That’s how spread out the weight is. As a landlord, I always insist, that if a tenant is thinking of having a waterbed, they need to produce two additional pieces of documentation, (1) confirmation from their insurers that should any damage be caused to the property or any adjoining property due to the failer of the waterbed they are comprehensively insured to cover all damage caused as well comprehensive cover for loss of rental income, (2) a report and calculations from a qualified Structural engineer to establish the suitability of the fabric and strucure of the property to support the additional load, all recomendations to be carried out fully under his/her supervision and at the tenant own expense prior installing a waterbed..